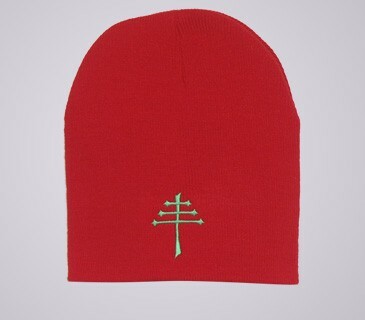 Red Knit Beanie with Green Symbol Symbol name: Maronite Cross (also known as "Tree of Life") Represents: Lebanese Christians Symbol History: The three horizontal bars of the Maronite Cross represent the unity of the triune God - the three persons of the trinity. The Lebanese flag is red, green, and white, with the prominent characteristic being the cedar tree in the center of the flag. The cedar has been used as a symbol by the Maronite Christians of Lebanon since the 18th and 19th centuries. The comparison between the Maronite Cross and the cedar tree is unmistakable. 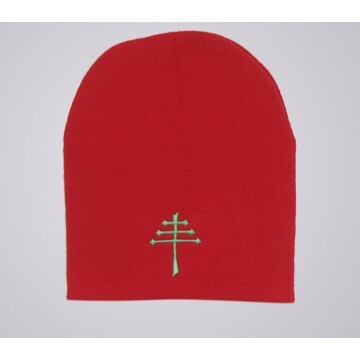 The tree represents peace, immortality and tolerance. The red stripes symbolize martyrdom and self-sacrifice, and the white represents the snow-capped peaks of Lebanon's mountains.